Section and plans of intramural features, Dun Grugaig. Ground plan of Dun Grugaig. Profile of Dun Grugaig and details of cells. 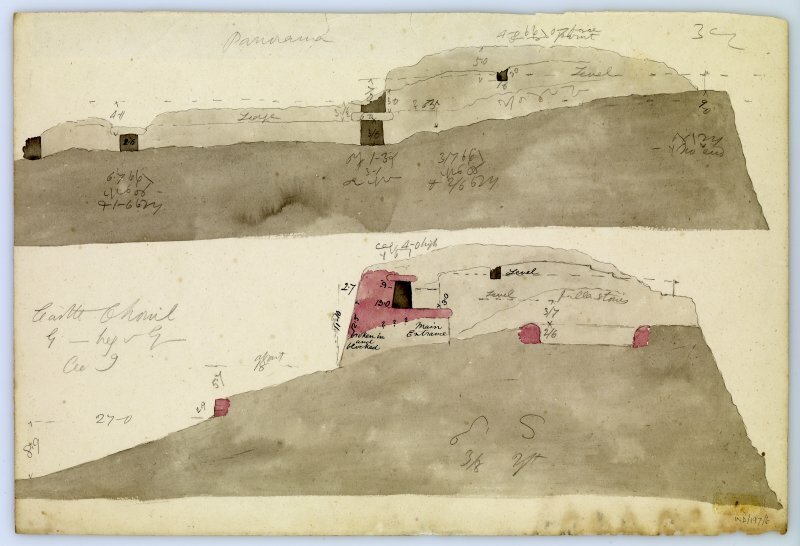 Plan and section of Dun Grugaig, Glenelg. View of broch from east. Original mounted photograph annotated by Erskine Beveridge 'Castle Chornil, Glenelg, from E'. From the RCAHMS Society of Antiquaries of Scotland Collection MS/36/209. Dun Grugaig, galleried fort or dun in a birch grove beyond Balvraid, near the head of the glen. It has a narrow entrance passage and mural cells similar to the brochs, but is semi-circular in form and open on one side, overlooking a steep ravine. L Bogle 1895; A Graham 1951; R W Feachem 1963. As described and planned above. The maximum external height, on the SE, is about 4.0m. Visited by OS (W D J) 3 October 1966. Graham's plan is incorrect (A Graham 1951), though Bogle's is a little more accurate. (L Bogle 1895) The main entrance is undoubtedly in the E at the easiest approach. The whole of its N side can be seen in the debris, including the door check. The S side is partially collapsed. The entrance shown by Graham and Bogle in the NNW is presumably the one referred to by Feachem (R W Feachem 1963) who quotes from Graham (A Graham 1951) when he mentions door check and bar hole. None of these features is now visible in what is certainly an aperture through the wall but filled with tumbled stones. It could be a second entrance, but the way in which it runs slightly obliquely through the wall suggests it may be secondary. In the interior is visible the inner face of a sub-circular structure c. 8.0m in diameter which is certainly secondary and may be of late date. Outside in the S and E are traces of what appear to be two outworks protecting the most vulnerable quadrant. Here are two natural terraces with their slopes studded with debris most likely from pillaged defensive walls of which two fragments survive in the outer terrace, and only one large slab from the outer face in the inner terrace. The name "Dun Grugaig" is known locally. Visited by OS (A A) 27 June 1974. This unexcavated D- or C-shaped semibroch in Glen Beag, Glenelg, Inverness-shire, stands at the head of the glen on a steep-sided, conical knoll; this has a precipitous southern side, now tree-covered, falling down to a stream far below (visited in 1962, 1964 and 1985 and planned in June 1986). This straight, steep slope forms the western edge of the open-sided structure which in plan is like a slightly squashed ‘D’. Dun Grugaig is a classic example of its type, the best preserved, and in some ways the most informative, among the whole group of these broch-like buildings. Glen Beag is an isolated, landlocked valley in which, closer to the sea, stand the two well preserved, solid-based brochs Dun Troddan and Dun Telve (NG81 2 and 3). Whereas these tower brochs are on or very close to flat ground in the cultivable part of the valley, the semibroch is situated on the rugged rising ground at the foot of the steep mountain slopes which surround the valley on three sides. A new plan of the structure (with cross-elevation) was made by the author in 1986; unknown to him then Swanson had made a plan two years earlier [9, fig. 98]. This building, as well as the interpretation of it offered here, is difficult to understand from verbal descriptions alone. In contrast with many other sites the 19th century plans and descriptions show Dun Grugaig in much the same state as it is today. The oldest recorder appears to be Alexander Gordon in 1720 who refers to a 'Castle Chonil' in the east part of the glen and as being distinct from the two brochs lower down , though he published no description of the site. 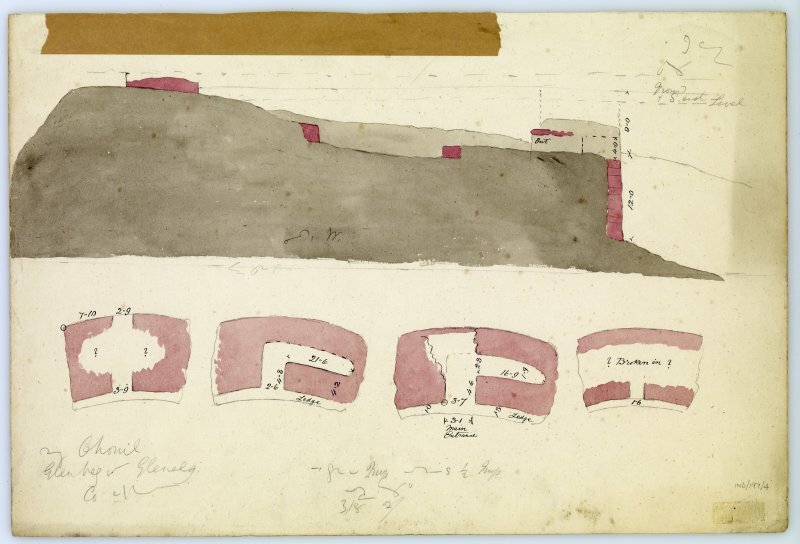 Sir Henry Dryden surveyed the ruins in 1871 and his plan is in the library of the Society of Antiquaries of Scotland. In 1895 Lockhart Bogle called it a "broch-like structure" and maintained that it could never have been circular because of its closeness to the river ravine . He saw what he assumed to be the first floor (Level 2) gallery exposed on the wallhead most of the way round with the wall on the south (uphill) side containing a short section of a lintelled, higher gallery, presumably in Level 3. He also noted a narrow wall along the edge of the cliff and saw several walls in the rubble-strewn interior. His sketch plan shows the main entrance on the north-west, close to the cliff; a gallery door is a few feet east of this and linked to the end of the long stretch of wallhead gallery. What appears to be a scarcement of the ledge type on the inner face is shown most of the way round, disappearing under rubble on the south side, and there is another door into the wall on the south-east. Bogle's diagram clearly shows lintels in position over the inner ends of all three doorways and evidently forming parts of the scarcement . It is of interest too that Bogle says that the two brochs lower down – Dun Troddan and Dun Telve – had already been “propped up” in his time, presumably by the Board of Works. He thought that the Board should pay the same attention to Dun Grugaig, an excellent idea that has still not been taken up one hundred and ten years later. 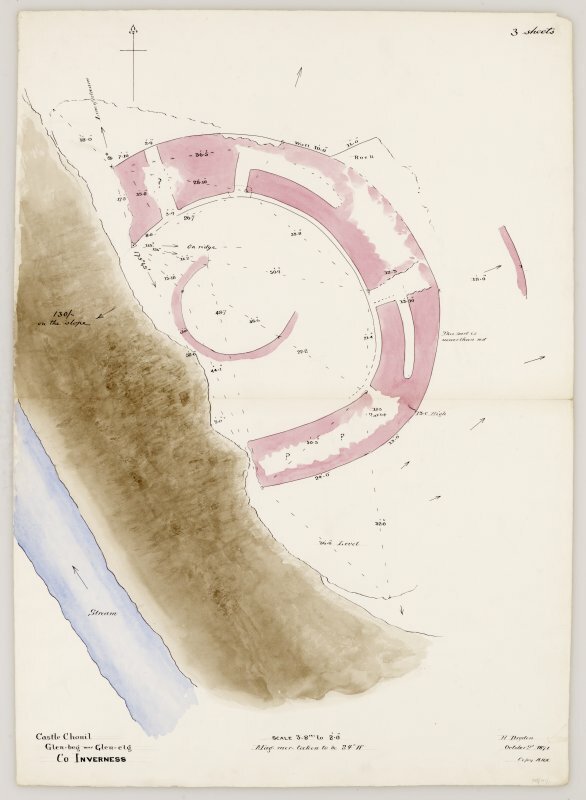 The next systematic description is that of Graham  who calls the structure not a broch but a “galleried dun”, evidently because of its non-circular plan. Unfortunately his plan, like Bogle’s, is diagrammatic and – being exactly D-shaped – was not based on systematic measurements [4, fig. 4]. He identified the main entrance in the same place as Bogle, in the north-north-west and 3.66m (12 ft) from the precipice; he saw the door-checks and also a bar-hole in the left or east wall, and the gallery door was seen 2.7m (9 ft) east of this. The south-east doorway, described by Dryden as the main entrance, was diagnosed as another gallery door by Graham, who could find no trace of its outer end and thought its position unsuitable for a main entrance; it is aligned transversely to a steep slope and would have been awkward to get at. He noted the lintel over the inner end of this door, and the void above it which connected with the length of lintelled upper gallery on the south-east. He was unable to decide whether this gallery was an ordinary first floor one or an inaccessible space. 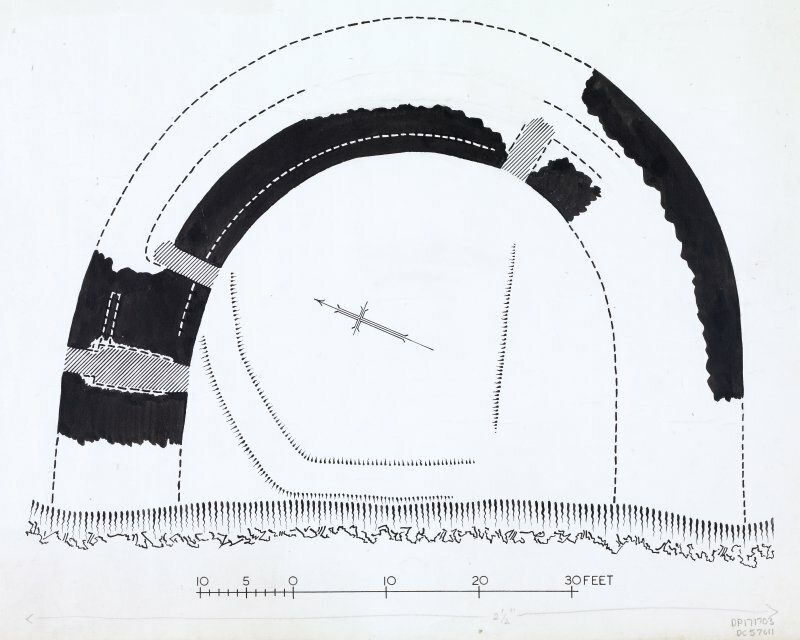 The site was first diagnosed, in 1972 by the author , as a semibroch – that is a structure with the same hollow-wall construction as a broch but non-circular and with one open side – and this diagnosis is confirmed below. A description by the field investigator of the Ordnance Survey in 1974  notes that the "main entrance is undoubtedly in the east at the easiest approach. The whole of its north side can be seen in the debris, including the door-check." He suggests that the entrance in the north-west may be secondary. For reasons given later the author is also certain that the eastern entrance was the main one so the clock-faces references given below take 6 o’clock to be at this point. The essentials of the description given here were published in 1991 . Traces of outworks were seen in the south and the east. 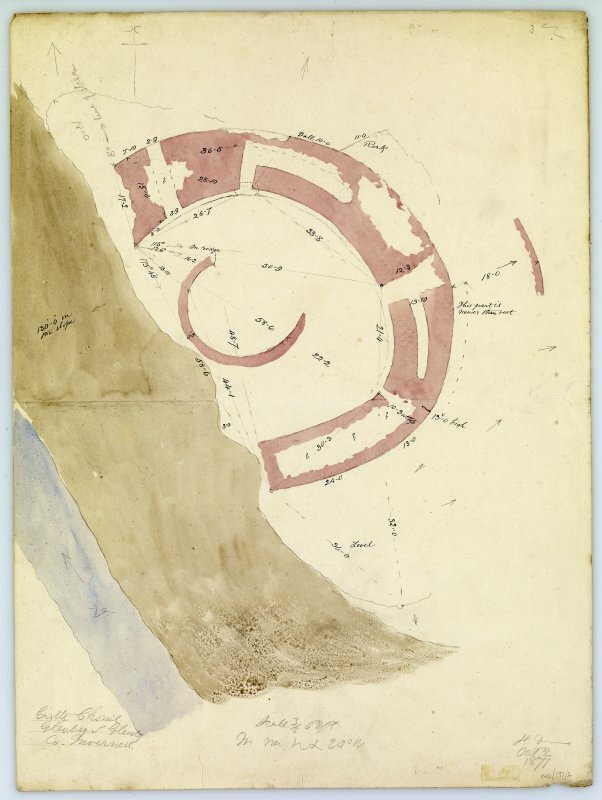 In plan the fort is like a slightly squashed D or C with the open, straight side along the edge of the precipice on the east, the curved stone wall being slightly distorted towards the south. The easiest approach, almost level and along the line of the precipice, is from the south (in the opposite direction to the glen below) and this ground is the highest on which the building stands. The edge of this precipice itself slopes gradually down towards the north. Thus the foundations of the wall are lowest along the northern arc and rest on a fairly steep slope. Three doorways can be seen in the inner wallface – no. 1 at 6 o’clock facing east, no. 2 at about 3 o’clock and facing north-east by north, and no. 3 at about 2 o’clock facing north-west by north. At the edge of the cliff (9-1 o’clock) the outer face is almost down to foundation level but elsewhere it is much better preserved, particularly on the east side. Traces of what looks like an unroofed upper (the reasons for thinking it to be an upper rather than a ground level gallery are given later)intra-mural gallery can be seen on the high wallhead on the south, at about 8 o’clock. A little further round, on the south-east, some kind of faulting has produced a vertical discontinuity in the coursing of the masonry but the length of higher, roofed gallery behind it (below) is intact. This section is much higher than the rest of the galleried wall on the north and is therefore an upper one; however since its floor is of rubble, it must be resting on a solid wall base. Its interior was thought by Bogle to have contracted within the last century [3, p. 183], and Graham also concluded that the opening had probably become distorted . However the photograph taken inside it by the author shows how all the lintels are still close together, level and undistorted; neither does the rubble floor appear to be composed of loose material, but rather to be of solidly packed wall core. This roofed gallery also has a carefully built inner end and in the author's opinion – and unless some unknown restoration has taken place – it is intact. The possibility that this gallery became ruinous and was reconstructed into its present form some time after Dryden's visit – probably early in the 20th century –must be considered, although the remoteness of the site would seem to argue against this. 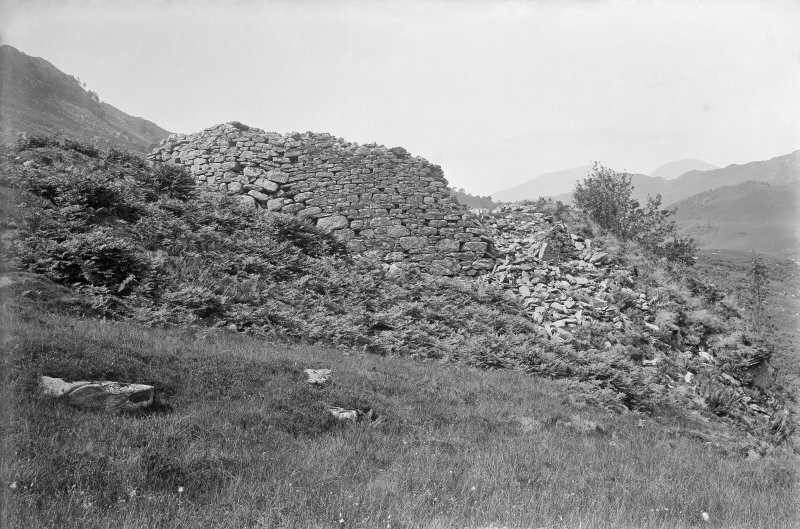 On the other hand Office of Works employees, including stonemasons, were not far away in the same glen in 1914 (at Dun Troddan) and in about 1918-1920 (at Dun Telve), to clear out and consolidate those brochs. It is possible that they did some consolidation work at Dun Grugaig also. We also know from Bogle [3, 183] that the brochs were “propped up” some time before 1895 but earlier consolidation of Dun Grugaig at the same time seems unlikely because of Bogle’s description of the state of the roofed gallery. A search in the archives of Historic Scotland might reveal something. As noted the outer wallface in the same area has subsided and faulted a little (at about 7.30 o’clock) although this does not seem to have damaged the gallery [4, pl. VI, 5). As was observed by Graham this short, roofed gallery communicates with a large chamber above the eastern doorway (no. 1); the rubble floor of the latter is at the level of the passage lintels and not “3 feet higher up” as maintained by Graham [4, 22]. It is possible that some rubble has been removed from the gallery since 1949. The inner half of the left or south side of this chamber is preserved for a height of about 75cm, and the corner between it and the inner wall of the raised gallery is clearly visible. From what was observed by the O.S. investigator in 1974  it must be concluded that this partly lintelled south-east doorway must be the main entrance into the building; the small plan on the original O.S. index card shows the right or north side of the passage complete, including the outer corner and a door-check about 1.8m in from it. The four long lintels in position over the inner half of the passage, and the well built chamber above these, are characteristic of a fully developed broch entrance passage. The innermost lintel appears to be about 40cm above the adjacent ledge scarcement which runs round the inner wallface. Unfortunately the outer half of the passage is now badly destroyed and hidden under rubble and the features seen in 1974 are invisible; a radial depression in the rubble certainly suggests that it goes right through. The door-check seen in the left wall in 1974  could not be observed in 1986. An interesting feature, not hitherto commented on specifically, is visible in the right (north) wall of the passage. By peering under the main passage lintels a narrow vertical opening, bridged with a short lintel, can be seen in the side of the passage about half way through the wall; it resembles the opening to an unusually narrow intra-mural gallery. As far as can be seen the opposite, south wall of the passage is quite solid. This small opening was probably seen by Bogle as he indicates that the wall gallery joins this passageway. The inner face of an intra-mural gallery is exposed on the wallhead for some distance clockwise from gallery door 2 on the north – from about 3.30 to 4.30 o’clock. This door leads in from the interior, where its innermost lintel is in position; the corner which the right wall makes with the inner face of the gallery leading to the right can also be seen. The left face can be traced further into the wall so the gallery evidently ends here, as both Bogle and the O.S. investigator saw [1, 3]. About 4m further round anticlock-wise, and only a few feet from the west end of the wall at the precipice, is a second entrance (no. 3) at 2.30 o’clock which goes right through the wall and faces down a very steep slope. It apparently has a complete door-frame with checks of built rebates with a bar-hole and socket behind them . Only the door-check on the left (west) can now be seen, and the same side of the passage can be traced right through the wall. A fine ledge-type scarcement about 30cm wide runs round the inner wallface from this entrance and almost to doorway 1 in the east. As noted this seems to have been much better preserved at the end of the 19th century, when Bogle describes it, and when the three innermost door lintels seem to have formed part of it. The interior is full of rubble almost to the level of this ledge but the underlying rock surface probably rises towards the cliff edge as at Dun Ardtreck (site no. NG33 2). The outer wallface on the north-east arc (north of door 1) is mostly only a few courses high; however at one point, where the wall crosses a cleft in the rock, it is built down skillfully into this gap. There are traces of an outer defence on the south side a few metres from the wall and running across the line of easiest approach. more outer walls are further down the slope to the east [1, ill.]. Within the central court there is a curved secondary wall on the north and west, looking like the remains of a circular roundhouse inserted into the dun. There is no trace now of the wall along the cliff edge observed by Bogle . 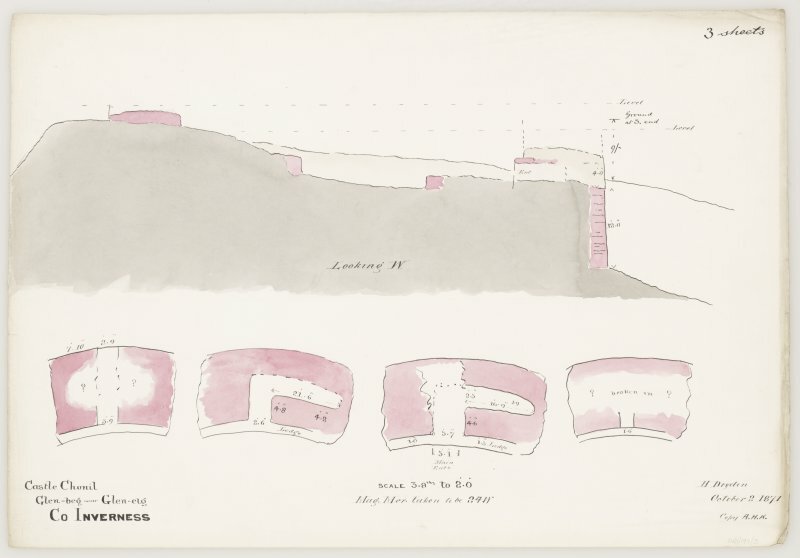 A cross-section of the site from north-south – surveyed in 1986 and measured with a steel tape and an indian clinometer –makes it possible to infer with some confidence the way the hollow, galleried wall of Dun Grugaig was built on the sloping and uneven top of the knoll. A number of structural features can now be seen to be important – for example the fact that the wall is built on uneven rock, so that the basal courses of the higher, or southern, end of the building are considerably higher than those of the north end – perhaps as much as 3 - 4m. Secondly the 3m length of upper gallery on the east arc is hardly damaged at all, and neither is its inner end blocked by the crushing together of the side walls; it appears to be intact, with level lintels and a carefully and deliberately built wall at its inner end. Thirdly this gallery is resting on a solid wall base which can be seen inside it since there is in fact very little loose rubble on its floor. It is also apparent in the continuous left wall of the entrance passage below it, which is in effect the end of this solid basal section. In the absence of a really well preserved semibroch standing on uneven ground one cannot be sure how the top of the galleried wall would have been built. In such circumstances a level top would have to accommodate the fact that its height above the ground would steadily increase so that more galleries would be needed on the downhill side. Otherwise it would have to have been stepped in some way to compensate for the slope. The fact that all observable scarcements and galleries in brochs and and semibrochs are always built level suggests that the wallhead was also level, whatever the nature of the underlying ground surface; yet much building material would be saved, and perhaps greater stability achieved without loss of defensive effectiveness, if the wallhead followed the ground surface approx-imately by being stepped. There are good reasons for thinking that, of the two sites which clearly do possess some uneven and sloping galleries – Clickhimin (HU44 1) in Shetland and Midhowe (HY33 1) in Orkney – the first has been unskilfully restored in modern times. Midhowe may also have been but distortion due to partial collapse in Iron Age times could also account for the irregularities. For example the cross-section of Dun Grugaig from north-north-west to south-south-east shows that one would expect the wall at the south end (on the highest ground) to be reasonably high because this is the line of easiest approach; the foundations are also at the highest point here. A barrier containing at least three galleries (perhaps on a low solid base – see below) with a parapet, and reaching a total height of about 6.1m (20 ft) , would seem to be the absolute minimum here, and a 7.6m (25 ft) wall would be safer. Yet the ground under the north end of the wall may be 3.0m lower so a level wallhead and galleries would require two extra galleries on that side, on a wall base only 4.3m thick. The question must be left open until the site is excavated and the nature of the wall foundations all the way round revealed; however a stepped wall seems most probable. The structure of the wall at the uphill or south end is in fact fairly clear. Immediately south of the lintelled main entrance there appears to be a solid wall (or platform) of which the left wall of the passage forms the end and which supports the Level 2 covered gallery; this is Level 1 south of the entrance. However the covered gallery itself also ends at a carefully built wall so evidently Level 2 becomes solid as the ground rises towards the south. What we seem to have in the southern arc is a solid platform which has been built in two steps to counteract the sloping ground – the first step being the left wall of the passage and the second the end of the lintelled gallery. It seems highly probable that the end of the wall – where it crosses the ridge on the south and approaches the cliff – is founded on a fairly low solid base and has a short gallery inside it (forming Level 3 here). The lintels of the Level 2 gallery above the entrance are less than a metre above the present ground surface outside the south end of the wall and this – together with the carefully built inner end wall of this gallery – shows that there is another solid step up in the wall base in the south-east arc. In other words, though Level 2 seems to be hollow most of the way round, it evidently becomes solid at the south end of the wall (just as Level 1 becomes solid at the south side of the main entrance). Thus any intra-mural gallery in the south end must be up in Level 3 (with its base presumably at the level of the lintels of the Level 2 gallery) and must rest on a minimum of about 1.5m of solid wall, as at Dun Ardtreck (NG33 2). The remains of this Level 3 gallery should be inside the wall here and may be completely enclosed and inaccessible unless there is a doorway to the central court hidden under the piles of rubble now resting against the inner face; there is a suggestion of a void in the inner face here. moreover there ought once to have been Level 4 and 5 galleries on top of it, with a parapet on top of everything; the top of Level 3 would only have been about 2.0m above the ground outside which is far too low for an effectively defensive, high, galleried wall. This high, stepped foundation platform on the south – which must have supported a great weight – obviously needed to be braced against the galleried wall further north. This was effectively achieved by the row of lintels, some of which still remain, roofing the main entrance, by a second row which once spanned the inner half of the wall on top of the chamber over the entrance, and no doubt by at least two more such shorter rows higher up. 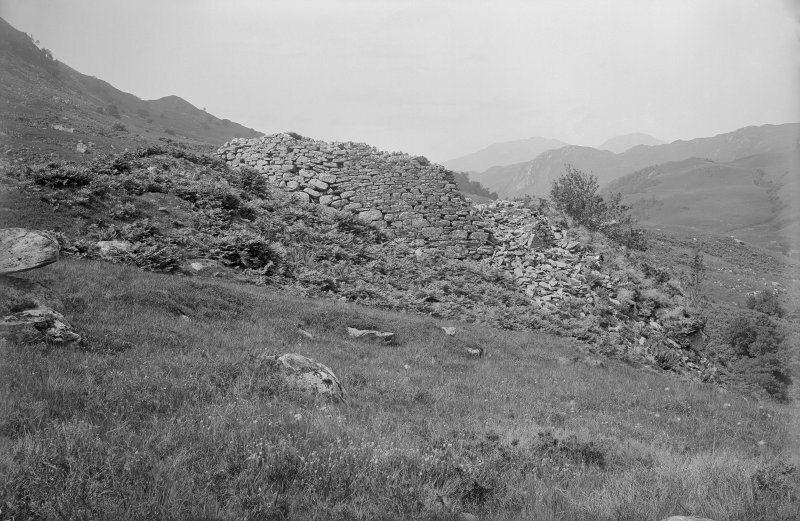 A similar arrangement, though on a shallower slope, was employed at the entrance of Dun an Ruigh Ruaidh (NH19 2). To the south of the main entrance is the long mural gallery which connects with the former and joins with doorway 2 at 3 o’clock. 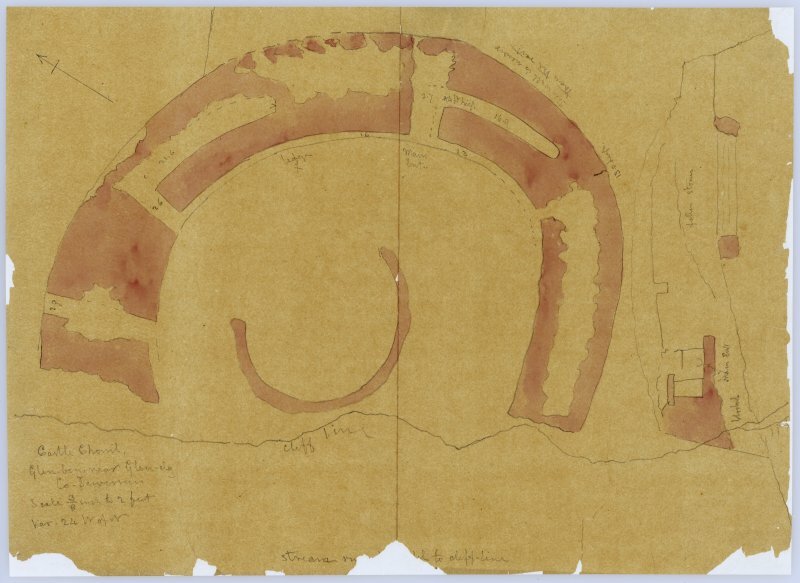 Although it is not entirely clear whether what one sees on the wallhead now is the base of the Level 2 gallery or the top of that in Level 1 (the latter seems more likely - Bogle’s drawing shows what look like the foundations of the Level 2 gallery here), it is clear that Level 1 from the main entrance round to the second entrance on the north (and probably to the cliff edge on the north-west) is hollow-walled, in sharp contrast with the same Level south of the passage. The descending ground suggests that, further round to the north, this gallery itself rests on a solid wall core of increasing thickness. This has to be called Level –1 and is doubtless similar to – although probably better built than – the basal rubble platform on which part of the hollow wall of Dun Ardtreck was founded (NG33 2). The second entrance near the north end of the wall may well be partly sunk into this presumed solid basement level and may have a high outer sill, also as at Dun Ardtreck. The gallery door at 3 o’clock on the north-north-east (no. 2) must be the door to the stair inside the Level 1 gallery It seems certain that the stair must rise clockwise a short distance south of this door so its remains should be buried inside the wall on the north-east arc. The Level 1 gallery to the right (north) of the main entrance, being behind the stair, should thus have been another inaccessible space, sealed by the ascending stair (the tiny opening to it in the main entrance is too small to get into). It is interesting that the ledge scarcement on the inner wallface is about 40cm below the lintels of the main entrance (the author's earlier drawing wrongly shows it too high, at the level of these lintels (MacKie 1991, fig. 6)), and therefore presumably below the lintels of the Level 1 gallery. Usually one would expect the innermost lintel of the main door to serve as part of the scarcement – for example as at Midhowe (HY33 1) – and indeed this implied on Bogle’s sketch plan. Assuming that it supported the raised, annular floor of a wooden roundhouse inside the central court, the stone ledge may be quite close to the original ground surface on the upper (south) side of the court (perhaps only 60cm above it) – as at Caisteal Grugaig (NG82 1) and Dun an Ruigh Ruaidh (NH19 2). Conversely it could be as much as 3m above it on the downhill side. If there is a reason for the scarcement being slightly lower than expected it will only be revealed when the court is excavated. The existence of what looks like a second primary entrance at Dun Grugaig, is, so far, unique in broch and broch-like buildings. If the interpretation offered here is correct Dun Grugaig is one of the most sophisticated buildings in the entire group showing the broch hollow wall architectural tradition. 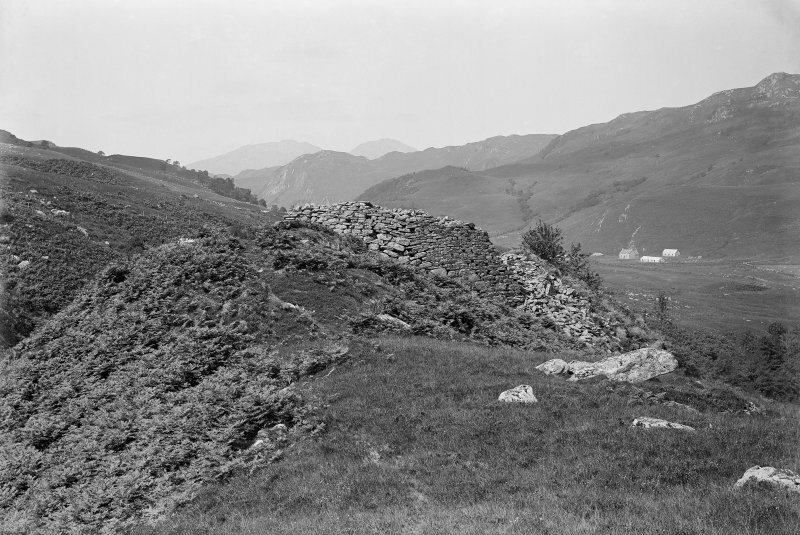 The way the galleried wall at this site is carefully and skilfully built on uneven, sloping ground with a remarkable stepped construction shows great knowledge and experience among the builders; both Dun Ardtreck and Dun an Ruigh Ruaidh have similar features but these were much less skillfully built. 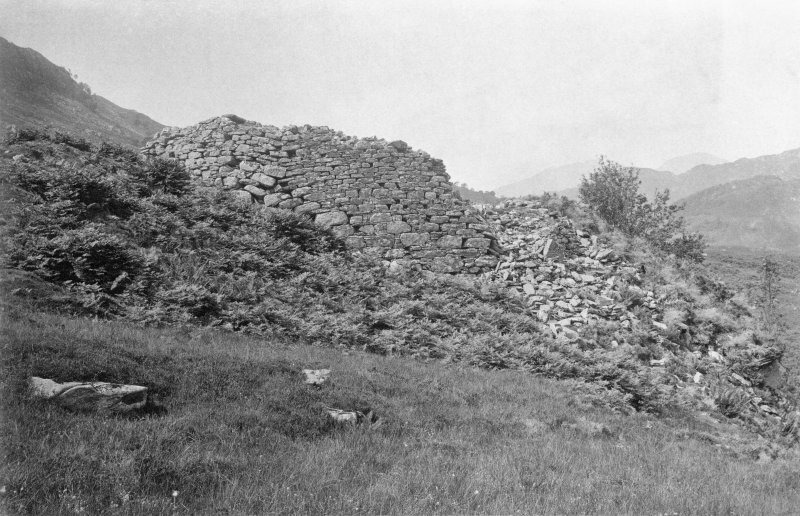 Because of its proximity to the two tower brochs Dun Troddan and Dun Telve (described below) – which are much more conveniently situated sites on or very close to flat farmland lower down the glen – Dun Grugaig surely shows us that hollow-walled broch architecture had evolved to an extraordinary degree of sophistication before the round tower itself was developed. It is hard to think of any other reason why this building should have been put up on such difficult ground if the concept of a round tower suitable for flat land was already known. Maximum width of central court along the cliff, 17.2m; maximum width, at about right angles to this, c. 12m; thickness of wall – 4.9m at door 1, 3.3m at door 2 and 3.8m at door 3. Door 3 itself, being at a slight angle to the line of the wall, is slightly longer. Sources: 1. NMRS site no. NG 81 NE 3: 2. Gordon 1720, 166: 3. Bogle 1895, 180-83; 4. Graham 1949, 19-22; 5. Young 1962, 189-90; 6. Feachem 1963, 181-82; 7. MacKie 1965, 139: 8. MacKie 1975, 162: 9. Swanson (ms) 1985: 10. MacKie 1991.